DAC Ph.D. student, Zhiqian Chen, presenting his paper at ICDM 2017. 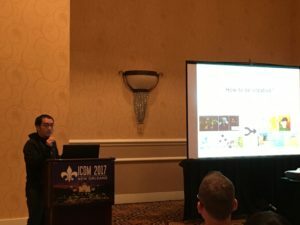 The Discovery Analytics Center was strongly represented at the IEEE International Conference on Data Mining (ICDM) in New Orleans, Nov. 18-21, with a number of accepted research papers by DAC faculty and students and DAC faculty serving on committees and panels. “A Probabilistic Geographical Aspect-Opinion Model for Geo-tagged Microblogs”(Ph. D. student Aman Ahuja and Chandan Reddy, associate professor of computer science, collaborating with Carnegie Mellon University and Singapore University). Ahuja presented this paper at the main conference and received a student travel award. “Data-Driven Immunization”(Yao Zhang, Virginia Tech alumnus and currently an assistant professor at the University of Memphis; Anil Vullikanti, associate professor of computer science at the Biocomplexity Institute of Virginia Tech; Aditya Prakash, assistant professor of computer science; and the Oak Ridge National Laboratory). Prakash presented this paper — chosen as a Best Paper finalist – at the main conference. “Distributed Representations of Subgraphs” (DAC Ph.D. student Bijaya Adhikari; Yao Zhang; Naren Ramakrishnan, the Thomas L. Phillips Professor of Engineering in the Department of Computer Science and director of DAC; and B. Aditya Prakash). Adhikari presented this paper at a conference workshop and won a student travel award. “Learning to Fuse Music Genres with Generative Adversarial Dual Learning” (DAC Ph.D. student Zhiqian Chen and Chang-Tien Lu, associate professor of computer science and associate director of DAC, collaborating with the Georgia Tech Center for Music Technology). Chen presented this paper at the main conference. Two former DAC students, Feng Chen, currently assistant professor at the State University of New York at Albany, and Liang Zhao, currently assistant professor at George Mason University, presented the paper, “A Generic Framework for Interesting Subspace Cluster Detection in Multi-attributed Networks.” They worked on this research with the Georgia Tech Center for Music Technology. Chen presented this paper at the main conference. “Online and Distributed Robust Regressions under Adversarial Data Corruption” (Ph.D. student Xuchao Zhang; Liang Zhao; and Chang-Tien Lu, jointly with George Mason University and the U.S. Army Corps of Engineers). Zhang presented this paper at the main conference. DAC faculty participation in the ICDM Conference included Chang-Tien Lu serving on the program committee and Naren Ramakrishnan serving as an area chair. Ramakrishnan also co-chaired a panel focusing on ethical and professional issues when dealing with social data with Tanushree (Tanu) Mitra, assistant professor of computer science, as one of the panelists. B. Aditya Prakash was invited to participate as a mentor in the ICDM Ph.D. Forum. The ICDM has established itself as the world’s premier research conference in data mining. It provides an international forum for presentation of original research results, as well as exchange and dissemination of innovative, practical development experiences. The conference covers all aspects of data mining, including algorithms, software and systems, and applications. ICDM draws researchers and application developers from a wide range of data mining related areas such as statistics, machine learning, pattern recognition, databases and data warehousing, data visualization, knowledge-based systems, and high-performance computing. By promoting novel, high quality research findings, and innovative solutions to challenging data mining problems, the conference seeks to continuously advance the state-of-the-art in data mining. Besides the technical program, the conference features workshops, tutorials, panels.